At this sad and difficult time, we are honoured that you have chosen to support Pancreatic Cancer Action. For many this is a time to cherish their memory and consider what their wishes would be. By supporting Pancreatic Cancer Action at this time, you will do so in the knowledge that all funds donated will make a vital difference to our work with early diagnosis projects. 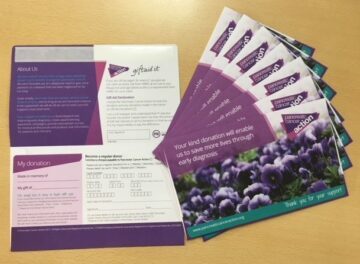 Please let your funeral directors know that you have chosen to support Pancreatic Cancer Action and that you will arranging a collection the funeral. or on 0303 040 1770 to order. The envelopes make it easy for friends and family to make a donation. Some people choose to insert the envelopes into the order of service making donations discrete.